Racing the antelope seems to be a pure folly. Why even try to outrun an animal that can eclipse even the fastest human being alive. No contest. Yet, in suggesting this impossibility in the title of his 2001 book, professor of biology and ultra marathon runner Bernd Heinrich suggests that most people could indeed do what they think is impossible. 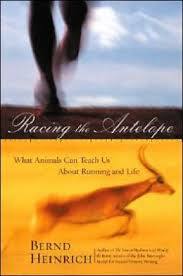 Not to outrun an Antelope in a sprint, but to have the stamina to outrun most animals over a long distance. For Heinrich maintains, humans are designed to run. And we would do well to learn from many different species in the animal kingdom to help us understand the physiology needed to run fast and to run long. Racing the Antelope concludes its final chapter remembering the author’s record setting 100 Km ultra marathon race which took place in Chicago in 1981 which he ran in 6:38:21, setting the official world record for that distance. And his success is all the more remarkable since Heinrich was already an accomplished biologist busy doing field work and publishing scientific papers. 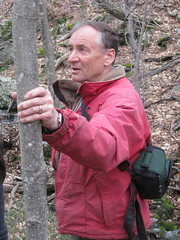 Yet specifically because of his analytic mind and intimate familiarity with the animal kingdom, Dr. Heinrich was in a position to bring a keen understanding of the science of running to bear on his own training. And train he did, running more than 100 miles a week in the lead up to his historic race. The author takes us on a tour of animals familiar to us yet he dissects their lives in a way which should bring fascinating appreciation to anyone and especially someone who knows the physical pangs of exhaustion from a long run or hike. He begins describing how the hawk-moth cools its body despite almost non-stop activity during flight and feeding. The author than goes on to describe the problem of overheating among human athletes. Fortunately, Heinrich explains, humans have a superb method of cooling via sweating. The author goes on to describe the mind-boggling migratory routes of various bird species, including the white-rumped sandpiper which flies 2,900 miles non-stop during its migration. Heinrich uses these amazing feats to deconstruct just how a species endures a physically exhausting activity. He discusses caloric needs, the anatomy of muscle placement to maximize flight and a unique avian mechanism for delivering as much oxygen as possible with each breath. Subsequent chapters peer into the world of frogs whose explosive strength in their hind legs shed light on the benefit of fast twitch muscle fibers over slow twitch. Unless of course you want to run for a long distance, like say, a 50 km race. In that case, a greater percentage of slow twitch fibers are beneficial. Remarkably, one can influence to some extent their own ratio of slow to fast twitch muscle fibers by the type of training one does he explains. Shorter but quicker sprints will favor more fast twitch fibers. The author goes on to write about camels as well as running among early hominids. But the central chapter of the book is about the antelope. Dr. Heinrich cites a scientific article from Nature magazine which declared the pronghorn antelope “the world’s premier ultra-running animal”. Indeed, the pronghorn has been timed at running 61 miles an hour. And while a cheetah can also reach high speeds, the pronghorn can sustain that rate far longer covering 7 miles in 10 minutes. What does the pronghorn have that we don’t? A combination of a high VO2 max, the ability to get the most work for the amount of oxygen available. Ultimately though the antelope couples this VO2 max with other unique adaptations, including a larger heart, lungs and windpipe, increased muscle mass and a higher concentration of hemoglobin in the muscle tissue to take up the available oxygen. “Pronghorns are just better at everything that affects sustained running speed”, Heinrich writes. He goes on to explain aspects of the endurance of camels including their unique methods of dealing with intense heat despite often limited access to water. And the author touches on the basilisk lizard and even differences in running between dogs and cats before diving into his own preparation for his record setting ultra. Anyone training for or thinking about training for a race or hike or backpacking trip that will take him or her out of their comfort zone should be inspired by just how hard Professor Heinrich trained. Yet he neither romanticizes his training nor describes his feat as superhuman. And that is the point of the book. We are, all of us, runners in our core. And we can run and, if properly motivated, run far. “The will to win means nothing without the will to prepare”, a quote Heinrich shares from Tanzanian marathon runner Juma Ikangaa, seems to aptly represent his core philosophy for all who dream to run farther than they have run before.